The decorating is beginning to make the centre of the house look more finished. DIY Dad has got to some tricky conceptual stuff which involves making neat joints in the skirting board where the corner of the room is an oblique angle with a diagonal descending valley board joining (exposed wooden beam). I have the better grasp of 3D problems and in any case the problem is of my own invention as I designed the extension, so I feel obliged to sweat the angles and help make it work. The extension works as a space and it is, I am sure, structurally sound – but my not being an architect can leave some awkward detailing in the final finish. The valley boards are two immense planks of oak which lace through the room and the room opening off it; from the window the triangle they make can be seen clearly. I love that as it was not part of the aesthetic plan but a structural necessity and the way the oak framer worked, yet it has turned out very pleasing to the eye, well at least my eye. The meal this evening was some home made burgers that NO2 son made in school, but he then made some lamb and mint burgers when he got home as well, the first ones were veal and sage. They were really very good, he dosn’t cook often but when he does he is very thorough and I’m not just referring to his ability to get every last jar of herbs out of the cupboard. Waitrose sell veal that is not the cruel white stuff but more like the oldfashioned suckler herd veal. 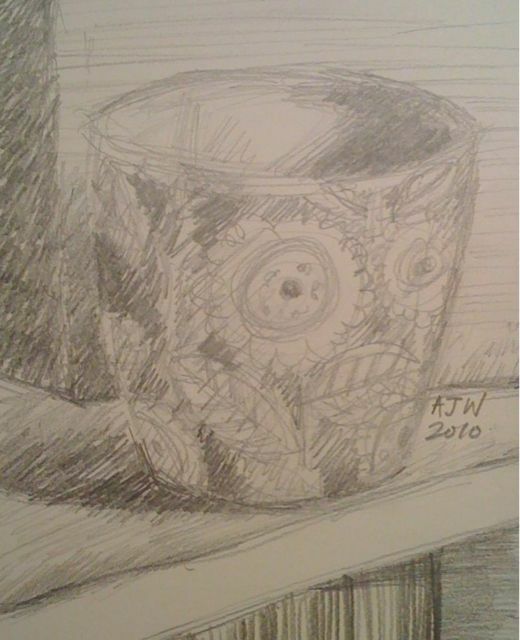 Today’s picture is simply a coffee cup in pencil. I also tried to sketch No2 son at the computer but I did not catch him in a still mood.